GiveForward, a Kickstarter-like site for people raising money to cover medical expenses, raised $500,000 in its first round of funding. It’s a charitable idea with one flaw: high fees. Regardless of your stance on the health care debate, it’s hard to deny that treatment can be scarily expensive for the uninsured. GiveForward, a Kickstarter-like site for medical expenses, tries to relieve the monetary burden for patients by giving them a fundraising platform. And now GiveForward has raised $500,000 in its first round of funding. 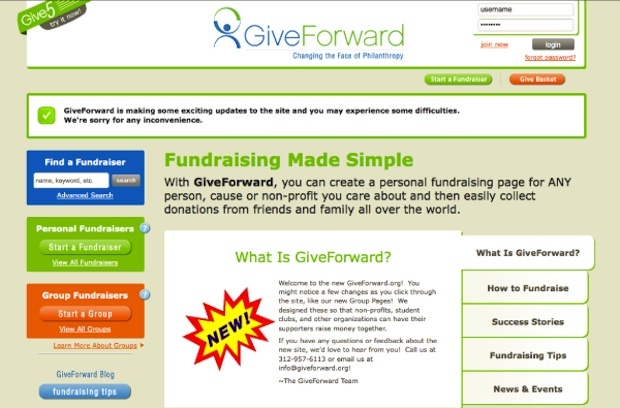 Since its inception in 2008, GiveForward claims that it has collected 10,000 members who have raised a total of $3.5 million for various medical causes, according to Chicago Breaking Business. A quick search of the site yields some impressive findings. One member raised $31,000 for medical expenses related to a brain tumor; another raised $11,295 for lung cancer treatment. There’s just one problem with GiveForward: the site docks 7% of all donations to make cash (as a comparison, Kickstarter takes 5% and passes on the Amazon credit card processing fee of 3% to 5% to the end user). Surely the company (and Kickstarter, for that matter) can find a more workable business model. child and my co-founder, Desiree Vargas lost her grandfather to cancer. Regardless of motivations, the site is continuing to grow. GiveForward’s cash infusion will go toward hiring fundraising coaches to work with site members, as well as toward efforts to work more with clinics and hospitals on connecting patients with the site.